(FRANKFURT, GERMANY – September 16, 2015) Lexus enhances the design of the GS line-up. The Lexus GS continues to feature impressive agility and sporty handling, as well as comfortable ride quality for extended highway driving. This is no modest mid-size luxury sedan. Its engaging performance and amenities make the GS an excellent choice for delighting drivers as well as luxury connoisseurs whether they are piloting the GS 350 AWD or GS 450h. 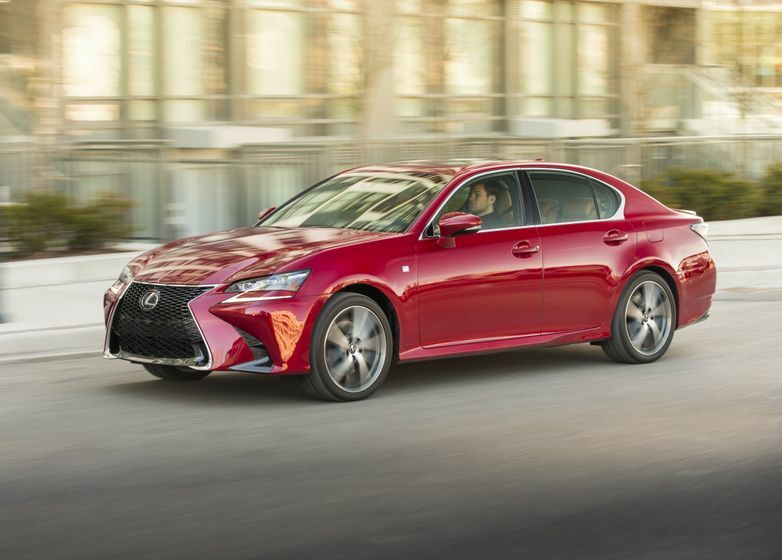 The Lexus GS epitomizes the intersection of style and refinement with a strong rendition of the Lexus signature spindle grille, framed by elegant satin chrome trim and flanked by distinctive new standard Bi-LED headlights. A new front bumper and rocker panel design further sharpen the coupe-inspired profile, with the makeover extending to revised taillights, revised rear trim and new 18- and 19-inch machine-finish wheel designs. In the interior, the analogue clock located in the center of the dash is housed in a single ingot of aluminum and uses LED indicators. It adds GPS functionality for adjusting the time zone. In the GS 350 AWD, a more muscular 3.5-liter V6 produces 311 hp and 280 lb.ft. of torque and is also paired with the six-speed automatic transmission. The V6’s combination of direct fuel injection and additional port fuel injectors ensure ample power and crisp responsiveness. Leading the GS line-up is a car you’d expect from the luxury hybrid leader, the GS 450h – a high-performing hybrid. Its Lexus Hybrid Drive system combines output from an Atkinson cycle 3.5-liter V6 engine and a water-cooled permanent-magnet electric motor for 338 hp total system, channeled through a planetary-type continuously variable transmission. Few might expect 5.9-second (0-100km/h) acceleration performance from a car with 7.6 L/100km combined fuel economy ratings. For added grins when driving, the F SPORT package available combines track-tuned chassis enhancements, with exclusive exterior and interior design features. For better ride comfort and handling stability the F SPORT package includes also the Adaptive Variable Suspension (AVS). The 2016 Lexus GS is a rolling testament to the brand’s commitment to cutting-edge safety technology. Its structure and 10 standard airbags form the foundation for occupant protection, while a wide array of driver-assist technologies help the driver to avoid hazards. New and optional is Lexus Safety System + which combines Pre-Crash System (PCS) with Pedestrian Detection, Lane Keep Assist (LKA and All-Speed Active Cruise Control. All-Speed Active Cruise Control works at a range of speeds. It tracks the speed of the vehicle traveling ahead and can adjust the speed setting accordingly to help maintain a preset distance. It’s sophisticated enough to smoothly adjust acceleration and deceleration when a vehicle enters or exits the lane or highway ahead. Using a combination of millimetre-wave radar and a front-facing camera, PCS can help detect vehicles -- and in some circumstances, pedestrians. The system can warn the driver of a possible collision and can initiate automatic braking with Brake Assist if necessary. Using a camera to detect visible lane markings, Lane Keep Assist (LKA) is designed to convey audio-visual alerts and vibrate the steering wheel if the systems determine that the driver unintentionally deviated from the lane. It also assists the driver steering the car back to the middle of the lane. The GS models equipped with new multimedia in 2015, and now the available 12.3-inch screen gains full-screen map capability when equipped with navigation. Other multimedia changes include enhanced voice recognition and graphics. You can still split the screen into two sections to show different functions, such as navigation, audio and climate control information. New side “enter” buttons on the Remote Touch Interface controller and shortcut menu on the side of the screen make it even easier to use to operate climate control, audio, phone, navigation and more. More power for GS 350 AWD – now 311 hp and 280 lb.ft. of torque from 3.5-litre V6. Re-designed front end with bolder Lexus spindle grille and Bi-LED headlights, and revised tail lamps and rear bumper treatments. Lexus Safety System + combines Pre-Crash System (PCS) with Pedestrian Detection, Lane Keep Assist (LKA) and All-Speed Active Cruise Control. New exterior and interior colours, wheel designs and interior wood and aluminum trim selections. Analogue clock adds GPS time zone functionality. GS 350 AWD: 311 hp, 3.5-liter DOHC V6 with dual Variable Valve Timing with intelligence (VVT-i). GS 450h: Lexus Hybrid Drive system combining output from an Atkinson cycle 3.5litre V6 petrol engine and a water-cooled permanent-magnet electric motor for 338 hp total system. GS 450h: planetary-type electronically controlled continuously variable transmission with two-speed reduction (for “kick-down” functionality), Snow mode and paddle shifters. 18 and 19 -inch alloy wheels with 235/45R18 and235/40R19 tires. The GS is standard-equipped with 10 airbags, including a knee airbag for both, driver and front passenger, seat-mounted side airbags for outboard rear seats, and side curtain airbags. The available 17-speaker Mark Levinson premium surround sound audio system has 7.1 channel surround-sound through 10 channels using a class D Digital amplifier with a clean 835-watts from 20-20,000 hz at only 0.01 percent total harmonic distortion. Clari-Fi technology analyses compression in the signal of digital tracks (CD, iPod, etc.) and determines how much amplification is needed, and where, to correct it.